This Land Rover Series III 4x4 Performance Portfolio: 1971-1985 is a collection of 42 original articles compiled from the pages of Autocar, Car, Car South Africa, Car and Driver, Diesel Car, 4x4, Land Rover Ltd, Modern Motor, Motor Trend, Road & Track, and What Car?. The information collected in these reprinted articles includeds 12 on & off-road tests, plus specifications , touring and long-term reports. 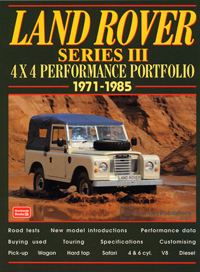 The second major face-lift in the life of the Land Rover was introduced with the Series III model in 1971. Production figures cannot be confirmed but it is thought that around 440,000 were built between 1971 and 1985. As this was a bad time for British Leyland most of the profits went into the car division and few changes were made. Even when Land Rover became a separate operating division in 1978 it took until 1983 for a replacement to be produced. Not every market took to the new vehicles so the Series III remained in low volume production until 1985. This is a book of contemporary road and comparison tests, specifications and technical data, off-road reports, long terms tests, driver's reports, plus advice on buying a used example.